Davy Jones of the Monkees said he still hears the funniest lines from people he meets. 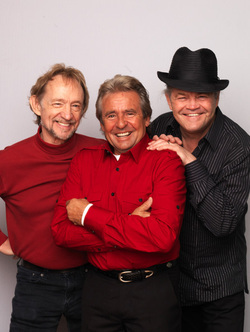 Now a vibrant 65, Jones is one of three original members of the Monkees quartet who will be appearing as part of “An Evening With The Monkees: the 45th Anniversary Tour” June 29 at the Genesee Theatre in Waukegan. For this two-hour, multi-media concert presentation, Jones will be joined onstage by Micky Dolenz, 66, and Peter Tork, 69, and a back-up band as they offer a set list with more than 40 songs. “Everything sounds the way it was, but it’s just a little more 2011,” said Jones. The singer said he considers himself blessed to still be on stage. Absent from this reunion will be Mike Nesmith, who last toured as a Monkee in 1998. “For that tour he stayed at a different hotel than the three of us. He traveled in his own transport. What does that tell you?” said Jones. But the tour still includes the music from the original foursome, and his contributions will be recognized. “We do four of Mike’s songs in this show. Mike stands there with Carole King, Neil Diamond, Neil Sedaka, Tommy Boyce and Bobby Hart who also wrote for the Monkees,” Jones explained. Once known as the Pre-Fab Four, the group was assembled in a Hollywood studio as characters in their own TV sitcom. That show’s band was designed to rival the popularity of the Beatles and its members did. In 1967, the Monkees outsold the Beatles and the Rolling Stones combined. Jones, Tork and Dolenz last toured together in 2001 before personalities clashed and Tork went his separate way. A decade later lessons have been learned. And the fans who have been waiting for the Monkees to get back together again. “Some of these people haven’t been out at a concert for years and we’re just renewing a friendship that has never gone away, really,” Jones said. He noted that fans were surveyed online to find out what they wanted to hear in this concert, and they’ll get what they want. Jones added that “Head,” the only Monkees film, was co-written by Jack Nicholson, and was overlooked when it opened in 1968. Jones said it hasn’t been decided yet if there will be a DVD or CD recording of this reunion tour which continues through July, but he hopes to keep the fans happy.